In just a few hours I will be travelling to Greece in Hadrian’s footsteps, retracing the journey he undertook in the province of Achaia in 124-125 AD. “Hardly any emperor ever traveled with such speed over so much territory” the Historia Augusta tells us. Surely Hadrian was the emperor who honored the provinces with his presence the most. Nicknamed ‘Graeculus’ or ‘the little Greek’, Hadrian held a fascination for Greek philosophy and culture. The foundation for Hadrian’s affection for Athens and Greek culture in general may well have been established during his childhood education. Prior to becoming Emperor he was archon of Athens in 112. Not surprisingly, as Emperor he turned his attention to the east. He visited Athens at least three times, Sparta and Eleusis twice, in 123-124 and again in 128-129. Many Greek cities would benefit greatly from the emperor’s patronage in the form of numerous building projects and improvements. Athens was always one of Hadrian’s favorites among the cities of his empire. Epigraphic as well as literary evidence (particularly Pausanias’ Description of Greece) tells us about the many benefactions that he bestowed upon the old polis. Many of Hadrian’s benefactions to Athens have been dated to his 3rd visit in 131-132. Among his most ambitious projects was the completion of the vast Temple of Olympian Zeus, a project begun over six hundred years earlier. Other new buildings in Athens included a Temple of Hera and a Temple of Zeus Panhellenios, a Pantheon, a gymnasion and a new library. He also established the Panhellenion, a new league of Greek cities. The philhellenic emperor clearly hoped to restore Hellas to the greatness of her distant past. Photo taken in 2010 when I first visited Athens. 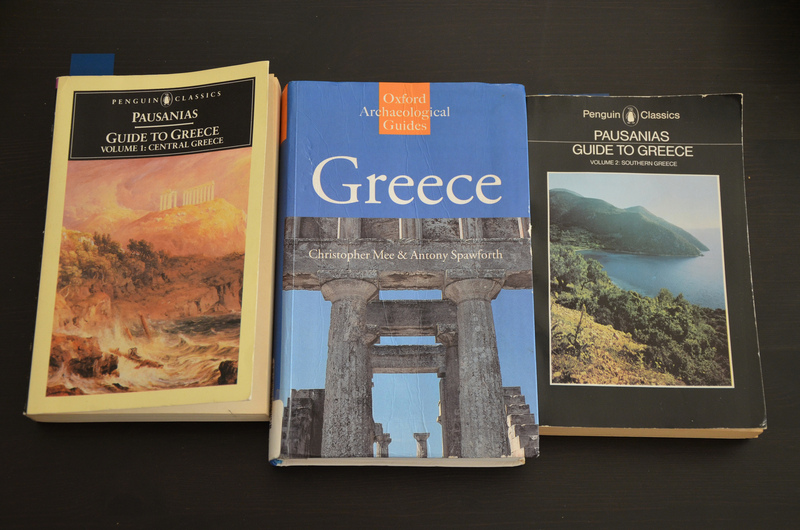 In the autumn of 124, Hadrian undertook an extensive tour of the Peloponnese, and this is the journey that I am about to embark on. His presence at many famous cities is well attested but his exact itinerary is quite uncertain at times. Hadrian’s fist stop was at Athens’ western neighbour Megara. From Megara, Hadrian proceeded over the Isthmus to Epidaurus and continued south to Troezen and Hermione and on to Argos. From Argos he entered into Arcadia to Mantinea and, in January 125, journeyed south to Sparta with a stop at Tegea on the way. It is not clear witch route he took from Sparta to Olympia (assuming that he did go there). From Olympia he set off eastwards across the Northern Peloponnese to Corinth. Hadrian was back in Athens in March 125. His journey did not stop there. After Athens, Hadrian travelled north into Boeotia and Phocis with visits to Delphi and Abae but for me this will be part of another journey. (Source for Hadrian’s itinerary: Hadrian, The Restless Emperor by Anthony R. Birley). I will be tweeting and posting many pictures while exploring Greece so join me on Twitter @carolemadge or/and Facebook. Next postFelix dies natalis, Marce Aureli! Hi Carole, Are you coming to Crete at all. If so let me know and maybe we can meet. Great post as always !